Home > Challenging a Will > When Can I Challenge a Will? The period after the death of a loved one is difficult for everyone involved. Generally all parties wish to see a prompt conclusion to the process of opening and executing the will; indeed, many people find it difficult to move on until this process has been completed. However, there are circumstances in which this may not be possible. If the individual has died intestate (that is, without making a will) there will be the potentially lengthy process of probate to deal with. But even when the individual has written a will, there are cases in which it is necessary to challenge the document. This can be done on a variety of grounds. If the will itself is invalid, you may be able to challenge it. In order to be deemed legally acceptable any testamentary document must adhere to strict rules. The most commonly overlooked of these is the witnessing of the signatures; the signing of the will must be witnessed by at least two disinterested individuals – that is, individuals that do not stand to inherit anything from the will. Most wills have an attestation clause. This states in legal terms that the will has been witnessed. However, you should bear in mind that this clause is not strictly necessary; a will without an attestation clause may still be valid, but an un-witnessed will can be challenged. The validity of a will also depends on the personal circumstances of the individual making it. The testator must have been of sound mind at the time that the will was written, and should have been properly aware of what they were doing. Crucially, the testator should not have been under any pressure from another individual to make or change the contents of their will. If it is thought that the testator had been under undue duress, there would certainly be grounds for challenging the will. If you are financially dependent on the deceased individual, but you have not been adequately provided for, you may have grounds for challenging the will. You should bear in mind that the circumstances in which it is possible to do so are very limited, and you will certainly need to seek legal advice before continuing down this road. It is legally possible for anyone who was financially dependent at the time of the individual’s death to make a claim of this nature. However, in reality the list of individuals that are likely to be able to claim is basically limited to: current or former spouses or civil partners (with the limitation that they should not have remarried); cohabitees (provided they have lived with the deceased individual for at least two years); and children, stepchildren or another individual considered a “child of the family”. It is generally more difficult for adult children to make a claim. 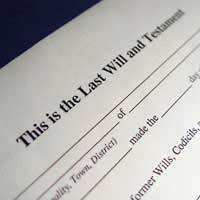 Challenging a will is a difficult and potentially emotionally unpleasant experience. You should understand that challenging a will can cause lasting rifts within a family, and that this step should only be taken in the most extreme circumstances. If you still intend to challenge a will, and think that you have legal grounds to do so, you should speak to a solicitor immediately, as claims can only be made within six months of the grant of letters of administration or probate.